**Guest post written by Glen Perry of Audio Mastered. He's been a musician for over 15 years and has done everything the hard way so you don't have to. You can find more advice and buying guides, such as the best Bluetooth transmitters, over at AudioMastered.com. "A common mistake bands and artists make is not paying attention to the economics of their merch table. Unfortunately, some bands shy away from a data-driven approach and only sell a few cliché merch items - think T-shirts. By taking a closer look at less expensive, but more profitable items, bands can add fresh additions to their revenue streams. Fortunately for us, one of the largest merchandise providers, Jakprints, has compiled and released a list of the most profitable merch items. 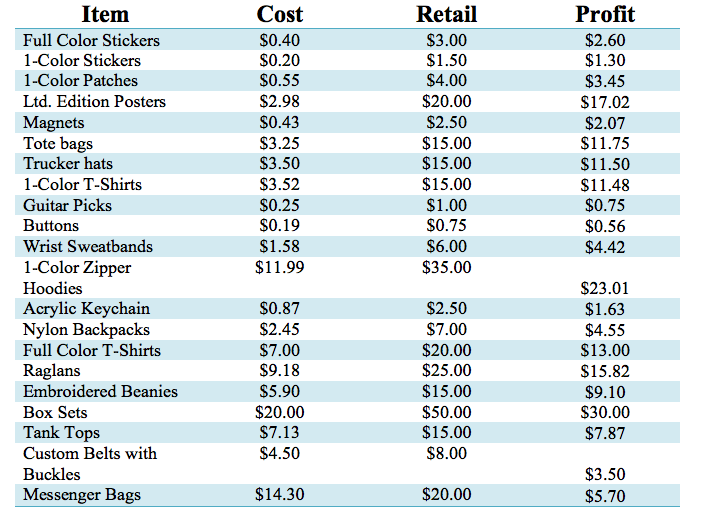 This information provides us with a unique inside look at the average cost, as well as the expected retail price, of each item. While each company and band is going to have slightly different numbers, the information below can be used as a great order of magnitude comparison. Here is the detailed information used to create the chart. Take note: the amounts below are the expected values. In other words, they will be unique for each band. Hopefully, the above charts give you a few more ideas you can play with when it comes to merch. If you’re able to order in small quantities, it won’t hurt to try out a few different opportunities for your fans. An understanding of the profit margin of each item is a great starting point for increasing your overall profits. For instance, knowing the high margins of limited edition posters and hoodies, you can place these items front and center on your merch table. Promoting and selling more posters and hoodies will get you farther than the standard T-shirt sales. 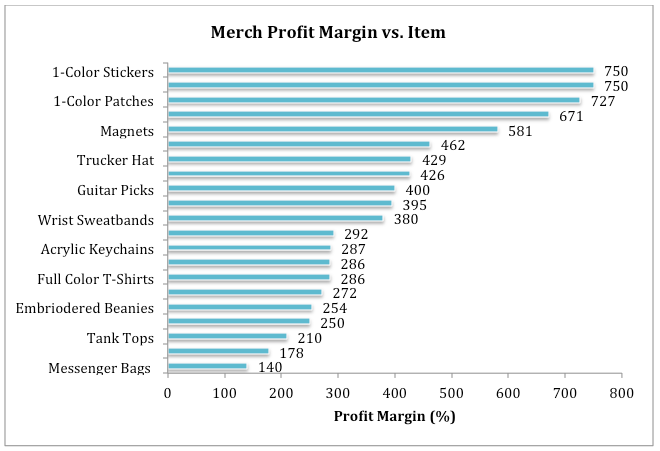 On the other end of the spectrum, stickers and patches have the least cost, but the highest margins. If you’re able to optimize your sales velocity for smaller items (such as selling them in packages) you can begin to drive up your profits. If you identify the highest profit margins with the most demand, you will be well on your way. Side note: if you are planning on printing T-shirts you should check out this useful T-shirt profit margin calculator. When adding additional items to your merch table there are a few best practices you should follow. Firstly, start with a low-volume run. The demand for the item must be validated before you make a significant investment. The easiest way to do this is to order a small amount of units. Once you know they are selling at a profit you can begin to ramp up your orders. Alternatively, you can run a pre-sale. This will help you gauge the interest from your fans and make the correct order from your supplier. This can easily be done on your band website, or social media accounts. Asking your fans directly is a great way to gauge product enthusiasm. This is an ideal use of those contact platforms you’ve been working so hard to build. Facebook and email lists are great vehicles for directly asking your fans what kind of merch they’d love to see. While stickers have the highest margins, they also have additional marginal benefits. Namely: marketing and exposure. Small items that can be easily slipped in a pocket are great for branding and acquiring new fans. They only cost under a dollar and they offer great opportunities for free promotion. You can also consider giving away a few of the cheaper items for free or as a package deal. Creating a package of a few stickers, an album, and a t-shirt is a great way to increase your overall profit per customer. The physical size of each item will also impose limitations. It’s much easier to carry around 500 stickers and patches vs. 500 hoodies or box sets. This problem can be avoided with online merchandizing websites. These companies can handle all the online sales, warehousing, shipping and printing of your merch. The downside is it’s going to cost you. Tracking your sales is going to prove invaluable over the long run. Keep an accurate record of inventory levels, sales velocity, revenue, and profit. This is the best way to incrementally tune your merch table until you’re a selling machine. Remember, incremental baby-steps add up significantly over time. By optimizing and tweaking your merch in a data-driven manner you will be able to increase your profits without much additional work. +The Numbers Don't Lie: Is Your Live Show Effective? I hope this article has given you some useful information you can use to optimize your merch table. Good luck! As always, if you’ve found this useful we’d appreciate a share on social media.